Home Basic Date Questions Questions using library methods How to print current date and time in Java? Write a program in Java that prints current date and time. There are 5 ways to print current date and time using following classes in java. Date - This class instance provides current date and time. Calendar - getTime() method of this class provides current date and time. LocalDate - This class instance provides current date. LocalDateTime - This class instance provides current date and time. ZonedDateTime - This class instance provides current date, time and timezone. Note : Java 8 is required to run below code because LocalDate, LocalDateTime and ZonedDateTime classes are part of Java 8 API. * @problem How to print current date and time? * Using Java 8 API classes. 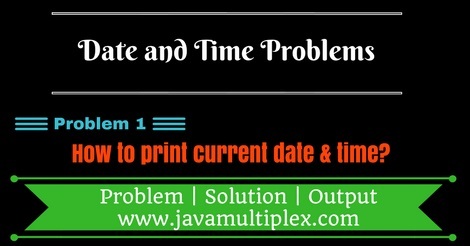 Output - How to print current date and time in Java? Tags : Date and Time Problems, Current Date, LocalDate, LocalDateTime, ZonedDateTime, Calendar.